On All Saints Day, I was part of an entourage of friends and Dominicans witnessing something a long time coming. My good friend, Tara Clemens, fulfilled her 4-year goal of paying back her student loans so that she can finally answer Jesus’ call to be his bride. At the time of this writing, she is a postulant at the Dominican Monastery of Corpus Christi in Menlo Park, CA. I was so joyful and proud to be part of her life at that moment. What annoys me sometimes about the friars is that we are so guyish about things. Now, when we enter the friars, we simply ring the doorbell, and Fr. Anthony, our novice master, greets us tells us where our novice cell is. And that’s basically it. No trumpets of grandeur. No incense. No letters from the Holy See or from our International Headquarters at Santa Sabina. No, just a “Hey, what’s up?” and a “Your room’s over there.” And most likely, a cup of coffee or tea for mom…I think. 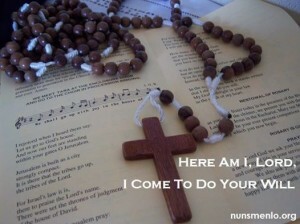 But no, with the sisters, our dearest contemplative nuns, they know how to welcome the newest into the community. And it’s for a good reason. With the friars, the world will see us again, granting, in a very different context. (And besides, our big entrance hoopla is Vestition.) But Corpus Christi is a monastery—cloistered. Dying to the world. Disappearing from Facebook and Twitter and blogs and television and radio. A life exclusively devoted to adoring God and praying for poor shmucks like me and you. Spending their lives in fasting, praying, studying the Word of God, contemplating Him in the Blessed Sacrament, kneeling while praying the rosary, living in a community of fellow sisters, all focused on the contemplation and the salvation of the world. Praying for us friars and our preaching, and devoting their lives as a holocaust to the Father. In comparison, my life is rather dull. So what is entrance like? What did Tara experience when she actually, and physically, entered the Cloister? Tara enters and she embraces the prioress, novice mistress and some other nuns. Indeed, for Tara, we do rejoice because we enter into the heart of the heart of the Church, into that New Jerusalem, a place where we are called to contemplate the face of God and be glad that He has called her His own. 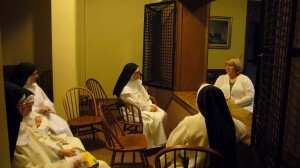 Her entourage then arrive to the chapel and meet the nuns. With Tara in front of her friends and sisters, she is called Sister Tara, and given the 15-decade rosary of the Order. we ask you blessing on Sister Tara as she begins a new way of life in your service in this monastery. Give her peace and courage and joy in her vocation. We also ask you abundant blessings on her dear family. Lord, prosper them with all the graces they need for a full and happy life on this earth and eternal union with you in Heaven. After this prayer, Sister Tara gives the sign of peace to the nuns, and then, to us. I and another Dominican priest bestowed a blessing upon her after a quick “Welcome home” and hug. “May the Spirit of Blessing and Wisdom come down upon you. May you be an instrument of God’s love, compassion and peace. Now, I’ve known Sister Tara since 2009 when I was a deacon in Anchorage. I was privileged to be with her as she worked hard at defeating her student loans, the one obstacle towards her entrance. Working with the Labore Society, they helped her raise money and offer development tips in order to allow her to fulfill her vocation. She is in a new beginning. There won’t be any random text messages or a Facebook ping. But a confidence that there is one more nun in the middle of Silicon Valley praying for the sorry soul that writes these words. Compared to hers, my life is so amazingly boring. Pray with me for her perseverance and deepening love of God. Holy Father Dominic, pray for us! What a beautiful posting, Fr. Isaiah, calling out Tara’s amazing new life. May this remind us of the thrill and joy and reception we can all experience by giving ourselves over to God’s will in each moment, and resting in the cave of Christ’s heart! Thank you for sharing. God bless Sister Tara in responding to His call. and good in every thing. Thank you for sharing! I truly appreciate it! Dear Tara, this is a brave and trusting step. One that I tried, but being an only child, I was obliged to be available to nurse both my Mother and Father during their last illnesses. God then pulled me to 10 years of studying theology. Your heart and spirit soar to the love of God and it holds you in the palm of God’s hand. I like this article from the Tablet.